Can I Have More Vacation? I was determined to knock my "Longest Day" story into shape, after all, it's due on Thursday. But I am addicted to Chef Gordon Ramsey and his two shows that are on now - Hell's Kitchen and Master Chef. They are scheduled for Monday and Tuesday nights and I spend too much time turning around in my chair and watching the action/reaction of these aspiring chefs instead of writing. Add to that the fact that my DH walks down to the computer room to "schmooze" about the shows with me multitudes of times (more than 15 times last night) and it's no wonder that by 9:00 pm I had only managed to do the final edit of pages 1 and 2. Argh! Chef Gordon Ramsey is great fun to watch. I think I'm an addict! I spend the 9pm-10pm hour with DH. It's part of our agreement that gives me some writing time at night. But, since I had accomplished little in the editing area earlier I gritted my teeth and went back to the computer screen at 10pm. It took until 11pm to finish the story and I still have to give it another read-through before sticking on the header and sending it off, but at least I'm done and any additional changes will be minor. That's great. The icky part of this is the fact that I got less than my usual 5-1/2 hours of sleep last night, so I feel like a zombie today. I'm very grateful that it is my day off, but my list of things to do is a mile long. 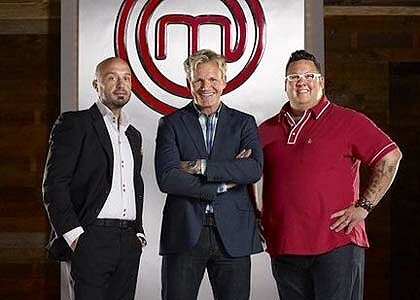 Master Chef stars L-R Joe Bastianich, Gordon Ramsey and Graham Elliot. It is a contest for amateur chefs only and is wonderfully fun. Edits on this story ran a huge minefield. They started with a total change of the POV of the story, and ended up with fine tuning. I maintain that I got very lucky with my assignment, I loved it and was able to work with it. The story will be among the batch released on the 16th and I hope my f-list enjoys it. In the meanwhile, I'm back to working on other things including my classwork which has fallen behind. More vacation please..... LOL. Yup, got it done and turned in. Sometimes writing something rather different can be a very good exercise and I'm sure you piece will be fun to read.